A new study by research-based marketing consultancy, Insights in Marketing, uncovers how a women’s psychological drivers can reveal tech preferences, social media habits and more. The study unveils five profiles and statistics, and paints a picture on how to communicate more effectively with women. IIM's new study uncovered 5 types of women, each with her own views and behavior toward technology. Women’s psychological drivers can reveal tech preferences, social media habits and more. 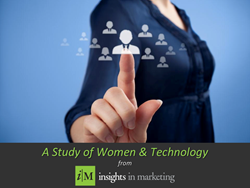 One-size-fits-all marketing towards women has never really worked, and now we’re learning why, thanks to Insights in Marketing, LLC (http://www.insightsinmarketing.com), a research-based marketing consultancy based in the Chicago area. The company’s i-on-Women™ Research analyzes what motivates women to buy, and organizes that information to paint a complete picture of her for marketers. The goal: to help marketers communicate more effectively with women and to help them create emotional bonds with their brand. Motivated by achieving goals and being recognized for that success. They are more likely to be tethered to a smartphone and use technology earlier and more frequently than their peers. They leverage technology to manage life’s hectic pace. Because these women are constantly on the go, they use technology to stay connected to others and stay up-to-date on the world around them. For them, Facebook leads the way in the most use, followed by YouTube, Twitter, and Instagram. Identified as traditional and are described as devoted, thoughtful, cautious, and consistent. They use technology that simplifies their lives, and are more likely to use a smartphone than most women (62 percent), but use it to stay connected to the most important people in their lives rather than taking advantage of all the bells and whistles. Half of these women still maintain a landline and plan to always do so. They tend to be hesitant adopters and really leverage technology once they understand its benefits and how it can be used to simplify their way of life. Driven by a sense of balance. They are disciplined and emotionally stable women who plan ahead. They’re not driven by new technology; rather, they’re more likely to adopt something that has been tested and validated. They’re more likely to be engaged in real-life interactions rather than spending time connecting online or participating in social media. They’re rarely the first one to test a new technology, preferring the tried and true. They’re less comfortable in social situations and less likely than other women to own a smartphone (49 percent). They’re often on Facebook, but use it to control what is shared with others to maintain the image they want to portray to the outside world. Constantly driven to experience new and exciting things. They’re early adopters of new technology, and are proud to introduce others to their latest discovery. They like serving as go-to experts for their friends and families, and also like to seek out information to consistently add to their knowledge base. The Internet is a major source of discovery, entertainment, and connection for them, and they’re comfortable downloading music, streaming radio, seeking jobs, sharing opinions online and more. To learn more about this study and others, please visit http://www.insightsinmarketing.com or IIM's blog. Five profiles revealing information about how a woman’s psychological makeup correlates with her approach to technology. Executive summary and overview of IIM's study on woman’s psychological makeup and its correlation to technology, the Internet and social media. Key takeaways from the study to help marketers communicate more effectively with women and to help them create emotional bonds with their brand.